You are here: Home » Commentary » Does big government crowd religion into a corner? Does big government crowd religion into a corner? The theme of the next election cycle may be big government. The Internal Revenue Service audits of conservative groups are a reminder that bigger isn’t always better. (David Axelrod, a former Obama adviser, said the problem eluded presidential ­supervision because “the government is so vast.”) The National Security Agency’s metadata-surveillance program seems both necessary and Orwellian. The signature programs of President Obama’s first term filled thousands of pages in the law books, and grew the size of government by trillions of dollars. The American Recovery and Reinvestment Act handed out $831 billion in stimulus dollars. The Dodd-Frank Act runs 848 pages. Obamacare will cost $1.1 trillion (probably more) over the first 10 years. Not that Republicans are models of restraint. President Bush gave us No Child Left Behind, Medicare prescription-drug coverage ($1.2 trillion, in one estimate), and a huge government reorganization for homeland security. I focus on the federal government because it gets media attention, but state and local governments have grown at a similar pace. Together, they employ 19 million Americans, six times more than the federal government. I don’t want to get into the merits of big government. I am interested in one of its side effects. In a world where the government is so big that it regulates the smallest aspects of our daily lives, we have had to reconceive religious freedom. We might call this the two-kingdoms view — the idea that religion and government operate in distinct and non-overlapping spheres. Difficulties arise only in the rare cases when religious dissenters are pulled into the machinery of government — for example, Quakers pressed into military service or Jews subpoenaed to testify on the Sabbath. Think now about the world of big government. Dallas has an ordinance requiring people who feed the homeless to register and be certified. Dallas would like to keep Big Heart Ministries from feeding people on the streets. The city of Alhambra, Calif., has accused the First Baptist Church of violating its zoning and fire codes by hosting homeless families. Chino, Calif., would like to prevent the Al-Nur Islamic Center from building a mosque. It argues that the mosque will violate the California Environmental Quality Act by not making adequate mitigation for increased traffic, sound and effluents. The state of Montana recently ordered the Hutterite Big Sky Colony to purchase workers’ compensation insurance over their religious objection. The Hutterites take a vow of poverty, hold their possessions in common and self-insure. Then there is the effort by the Department of Health and Human Services to require religious institutions and others to provide insurance coverage for surgical sterilizations and prescription contraceptives, including some that cause early-stage abortions. The department wants to mandate these services under Obamacare. It’s hard to hold the two-kingdoms view when the government’s kingdom occupies all the available space. Religion gets crowded into a corner, and must make itself smaller and smaller to avoid conflict. This is why for the past 50 years, we have elected to reconceive religious freedom. It may be unrealistic to insist that government shrink to a more modest size. Instead, we have chosen to view religious freedom as a right to exemption from laws that impose substantial burdens. We let the Amish ignore compulsory school-attendance laws after eighth grade. We excuse Native Americans from obeying the Bald and Golden Eagle Protection Act. We no longer have two small kingdoms that don’t overlap. The government’s kingdom is very large, but it allows little pockets of freedom (think Swiss cheese) for religious people. For about 30 years, the courts enforced this exemption model. 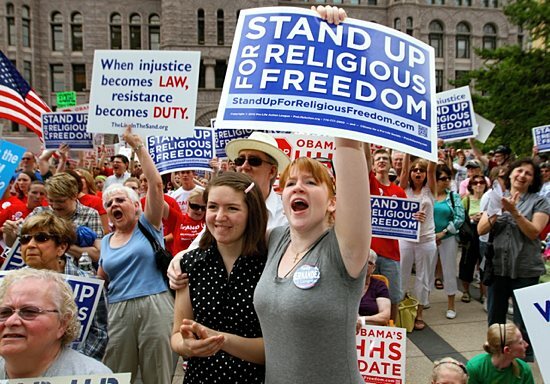 Twenty years ago, Congress decreed it in the Religious Freedom Restoration Act. The worrisome trend in recent affairs is the administration’s inclination to couple big government with an 18th-century two-kingdoms view of religious freedom. The enthusiasm for big government is obvious. The administration also wants to assert, like Jefferson, that man “has no natural right in opposition to his social duties.” Because it is unwilling to allow exemptions from its policies (think about the Health and Human Services regulations), it can avoid conflict only by making religion smaller and smaller. In this year’s Religious Freedom Day message, for example, Mr. Obama equated religious freedom with “the freedom to worship as we choose.” Worship is a private activity shared within a community of believers. The First Amendment protects the free exercise of religion, though, an idea that comprises many forms of activity motivated by conscientious belief. The president’s proposal was not an idle thought. It has been the administration’s position on a number of fronts. In the contraceptive regulations, for example, Health and Human Services defines “religious employers” as “houses of worship,” ignoring religious groups who have ministries of service (like Catholic Charities or Big Heart Ministries). In a Supreme Court case about the ministerial exception to antidiscrimination laws, the Equal Employment Opportunity Commission conceded that it couldn’t regulate the ordination of priests and rabbis, but argued that it could review the employment of religion teachers. This disregards the modern compromise we have made to preserve religious liberty in a world overrun with taxes and regulations. We have lately seen a number of reasons to oppose big government. Those who want more of it — if they have an eye on the next election — would do well to avoid adding another one. John Garvey is president of The Catholic University of America in Washington, D.C, and the co-author of “Religion and the Constitution” (Aspen Publishers, 2011). This article appeared in The Washington Times on July 1 and is reprinted with permission.